What I "study" has often caused some confusion amongst people. Many misunderstand my objectives and focus. So it is time to explain how I "study" the industry. Many are even confused as to what anthropology is, confusing and it for sociology or social science (three very different but related areas). There is nothing wrong with this, as it is a rather specialised distinction in a field many have limited experience with. One day I intend to describe and define anthropology, but just not right now. So I will stick to how I look at things rather than what I look at. The way I work is not always clear to people. And here I realise how I've forgotten that they did not dable into academic research. It is quite a silly mistake on my part to assume people know how a study works. Quite a few uni students do not understand this, so why should people who have never put a paper together. Below is a rough diagram to illustrate how I will be approaching my studies (I think research needs more diagrams). This is how I do things on the blog and in honours. The whole point of my studies is always a very specific concept. This specific concept is explored through studying companies, places and people which are part of a broader industry. My studies are not focused on the specific companies, or people, or even the broad industry. Lets look at example in action. I would never write a study of "the funeral industry" as this is way to generic. What is the framework? What would be the approach? Why would I write this study? These are just a few questions in a long line of things I could not answer. A study of the funeral industry would go nowhere and be useless as it is just way too generic. Instead I would write a study on a part of the funeral industry, say the modernisation of it. This would be my "general related concepts" as it is still broad, but a specific direction. I would then take this concept and narrow it even further, such as comparing the funeral industry to the tourism industry to show how certain concepts of modernity are still applicable in a digital age. This would be the point or "specific concept" of the research. To explore this concept I would look at specific companies, such as InvoCare and how they operate. The aim would never be to understand these companies, or the funeral industry. 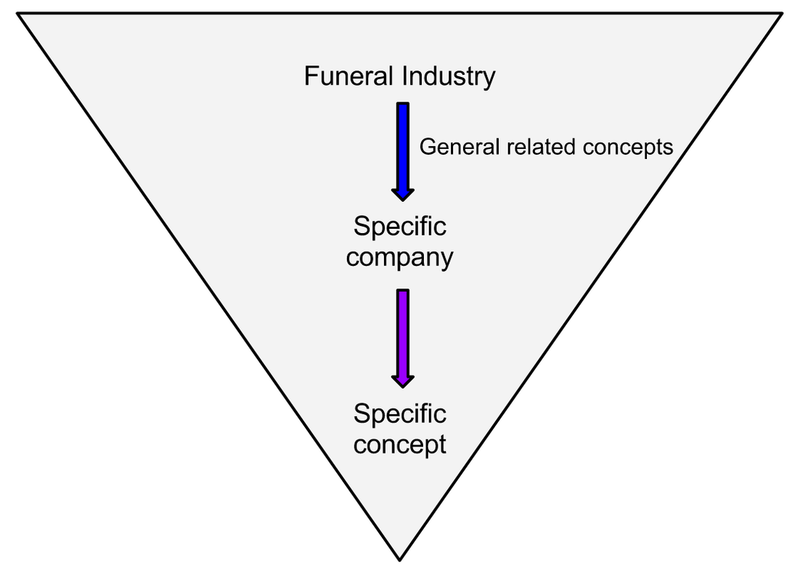 It would be to explore a specific idea within the context of the funeral industry and through these companies. In other words I have no intention of studying companies or individuals. Or even really to study the industry as a whole. No, I will dig deeply into one idea through the funeral industry and those within it. For this is how to give an argument a sharp and relevant point.